This Pureed Squash and Sweet Potato Soup is a recipe from my early-vegan days, and remains one of my very favorite soups to this day. I always rely on it this time of year, it's a comforting soup perfectly suited to the colder months when winter squash and sweet potatoes are plentiful. Plus, it's simple to make, and yields fairly big batch, which means leftovers go into the freezer for another night - meaning an even easier meal to follow! I adore soups and stews during the fall and winter. I don't know if there is a more cozy meal on cold days than a warm soup with crusty bread. As I said, this was an early recipe for me, from The Everyday Vegan. I don't post recipes from TEV often, simply because I don't have the electronic version of the final manuscript, and so posting recipes from this book requires retyping. When I made this soup again last week, though, I decided I'd take on the typing task to share it with you (ah, the sacrifices I make for you lovelies). 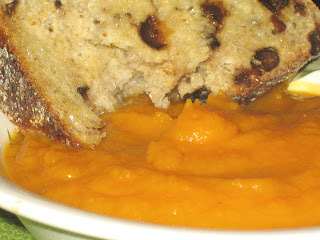 :) So, please link through to find the recipe for this Pureed Squash and Sweet Potato Soup from TEV. For this recipe, I prefer to first bake the butternut squash and sweet potatoes whole. Yep, stick 'em on a baking sheet lined with parchment and bake the suckers at 4oo for about an hour or until they can all be easily pierced with a skewer. Now, depending on the sizes of squash and sweet potatoes you use, one may bake more quickly than the other. I typically find the squash bakes quicker because I use fairly large sweet potatoes. If this is the case, you can either leave them baking together (if you estimate there's not much time left in the baking for both)... or remove whichever is baked throughout, and place on a plate to start cooling. Why do I use this method? First, I find it easier to use the softened squash/potatoes than to peel and cut through so much very hard veg. Second, I like the taste roasting gives the vegetables, and also the smell it brings to the kitchen. Whenever I make it, hubby says "it smells like Christmas in here"! And it does, because I roast squash for an entirely different dish that I make for our Christmas dinner. I love this soup also for its flavors and texture. The sweet potatoes add a thick, velvety smoothness that you cannot get from the butternut squash alone. The spices are not heavy, instead they give enough of a savory balance to the sweetness of the squash and potatoes, and with notes of cinnamon and fresh ginger that are natural matches for these winter vegetables. Here it is again, with a piece of fig and fennel bread from a local bakery. Simplicity and comfort all in one. Yes, life is good with a great bowl of soup. Sweet Potatoes AND Squash!!!! YUMM! In South Africa they are also labeled sweet potatoes. They are great and can be used so many ways I find. Thanks for the link to the soup recipe will give it a try when the weather cooler. Thanks for all of your help. I followed your recipe and it was wonderful. I don't think the kids would have liked it without the sweet potatoes. I did use a fresh pumpkin though since it was what I had. this soup looks amazing! so many winter squash soups on the interwebs today, it's hard to choose which one i must make for dinner! that bread looks delicious with that soup. what kind of bread is that? the sweet potato/yam thing has always driven me nuts! I never realized that they were called something different outside of Canada...this is good to know! Joanna,the bread IS delicious - and I'm a fan of both figs and the flavor of fennel, so it's an obvious favorite for me! It's a bread made a local bakery in Vancouver, called 'La Baguette'. Are you sure that sweet potatoes (orange flesh) are labelled as yams throughout Canada? I'm also a cookbook author, yet I live in New Brunswick and I find that yams (white flesh) are labelled as sweet potatoes. Maybe it's different throughout Canada. This really does look yummy, but alas, not a squash fan. I wish I was because it's in so many tasty looking dishes. I keep trying...maybe in time.